In November of 1933, Nelson, Van Meter, Carroll and Fisher were in San Antonio, Texas. On Dec. 11, Carroll shot and killed Detective H.C. Perrow during a robbery. That same month Nelson sent for Chase, still in California, and they remained together until Nelson's death. Shortly after they reteamed, a man was shot and killed in Minneapolis. Witnesses said the killers were driving a car with California license plates, and those plates were eventually traced to a car owned by Nelson. Chase and Nelson were next identified in Bremerton, Wash., and a short time later, they were seen back in Reno. Years later, Chase told an interviewer that Nelson killed a man in Reno during that period. He said the victim was a material witness in a mail fraud case involving associates of theirs, and that Nelson and the witness had got into an altercation over the coming trial. In April of 1934 Nelson, Helen and Chase were back in Chicago with Dillinger, and several others. Within days, the gang and its entourage was again on the move. Although Chase remained behind, Nelson and his wife went with Dillinger and the others to the Little Bohemia Lodge in remote northern Wisconsin. The party included Van Meter, Dillinger, John "Red" Hamilton, Tommy Carroll, and assorted wives, girlfriends, and even a family pet. The FBI proceeded to the lodge on April 22, 1934. They had planned to take the gang by surprise at night, but barking dogs sprung the trap too soon and the gang managed to escape in the darkness, but left their women, high-powered weapons, money and clothing behind. Nelson fled to a nearby house where he held several people hostage. A short time later, FBI Agents J.C. Newman and W. Carter Baum, along with the local sheriff, arrived at the house to alert the occupants about the trouble at the nearby lodge. As the car pulled to a stop, Nelson rushed to the vehicle and ordered the three men out. Before they could comply, however, Nelson began firing his .45 automatic. He hit all three, instantly killing Baum. Nelson managed to escape. Within days, Nelson was back with Chase in Chicago, and within a month Helen, and the other women arrested at the lodge, were released on parole. She quickly joined her husband, and the three moved to a small cabin near Lake Geneva, Wis. On June 23, U.S. Attorney General Homer S. Cummings offered a reward for Nelson's capture or information leading to his arrest. The heat on Nelson became intense. Members of the gang next surfaced on June 30, 1934, when Nelson, Dillinger and Van Meter, along with at least two other men, robbed the Merchants National Bank in South Bend, Ind. A police officer was shot and killed during the robbery, which was the gang's last together. The gang returned to Chicago, and several days later were meeting at a secluded area on Wolf Road, just outside the city, when police officers on routine patrol noticed them. As they approached to see if the men needed assistance, one of the gang allegedly open fire and the gang scattered. It would be the last time the gang's members would see each other. On July 22, 1934, A blistering hot night during Chicago's worst heat waves on record, Dillinger was shot and killed by FBI agents outside the Biograph Theater as he, brothel owner Anna Sage, and Dillinger's girlfriend, Polly Hamilton, were exiting after seeing the Clark Gable film "Manhattan Melodrama." Dillinger had been set up by Sage. Ironically, Nelson, who disapproved of Dillinger's many girl friends, had warned him just three months earlier at Little Bohemia that "a woman will be your death." Upon learning of Dillinger's death, Nelson, Helen, Chase, and two others immediately left Chicago for California. En route, they were stopped for speeding in a small town in Utah. Nelson paid a $5 fine and was promptly released. No fingerprints were taken, and Nelson's car, loaded with machine guns, shotguns and other high-powered weapons, wasn't searched. The sheriff that stopped him would learn months later that, at least for a short time, he had control of one of the most wanted men in America. In late August, the gang returned to Chicago, but within a month Nelson was back in Nevada and Chase was in New York City. On Oct. 10, 1934, they rejoined near Minden, Nev., and again returned to Chicago. 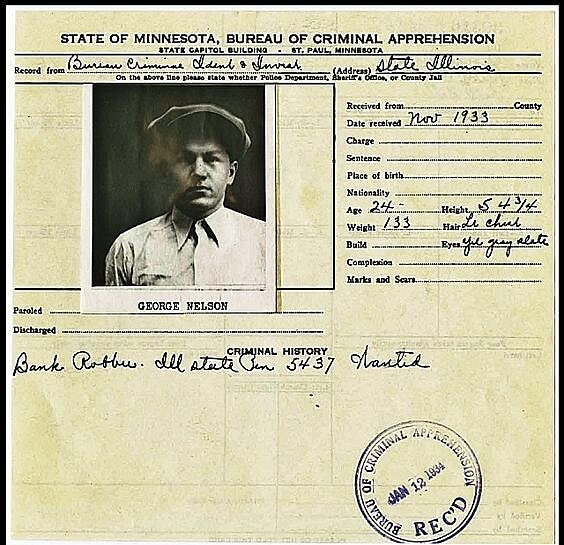 On Nov. 26, 1934, they stole a car and were making arrangements to allegedly meet with Alvin Karpis and others to make plans for a bank robbery. Nelson, however, had less than 48 hours to live. As Nelson prepared to leave for his meeting with Karpis, Inspector Samuel P. Cowley of the Chicago FBI office received word that Nelson had been seen in the Barrington, Ill., area, a short distance from Chicago. Cowley and Special Agent Herman Edward Hollis were dispatched to the area, and encountered Nelson and Chase on the highway just moments after the outlaws had been involved in a brief gun battle with two other agents. Cowley and Hollis began pursuing Nelson's vehicle. After a short distance, Nelson suddenly veered off Northwest Highway at the entrance to the North Side Park in Barrington, and stopped. Gunfire was exchanged, and Hollis, shot in the head, died instantly. Cowley, mortally wounded, died early the next morning. Helen Gillis, who had run from her husband's car when the battle began and was hiding in a nearby field, made her way to the agents' vehicle and the trio sped away. Nelson died at 7:35 that night. (His wife said she glanced at her watch when he stopped breathing.) His body was stripped of clothing and wrapped in a small blanket. It was left in a ditch near a Niles Center, Ill., cemetery where the FBI found it the next morning in response to an anonymous tip. Nelson's widow was arrested the following day. Having violated her parole from the Little Bohemia arrest, she was sentenced to serve a year and a day in the Women's Federal Reformatory in Mila, Mich. Following her release she faded into history. She died in Chicago in July 1987, at age 79 of heart disease. She never remarried, and is buried next to her husband. She rarely spoke of him, usually just saying, "Let him be." Both their children, Ronald and Darlene, went on to live quiet lives, and have also died. Chase was arrested in December and was tried for his part in the shootings of Cowley and Hollis. He was found guilty and sentenced to life. He served his time on Alcatraz and at Leavenworth. He was paroled in 1966, and died of colon cancer in California in 1973. One of Nelson's many ID cards.